Map of Quebec in counties. A beautiful example of the legendary American map publisher Samuel Augustus Mitchell Jr.'s 1872 map of the Canadian province of Quebec, or Canada east. 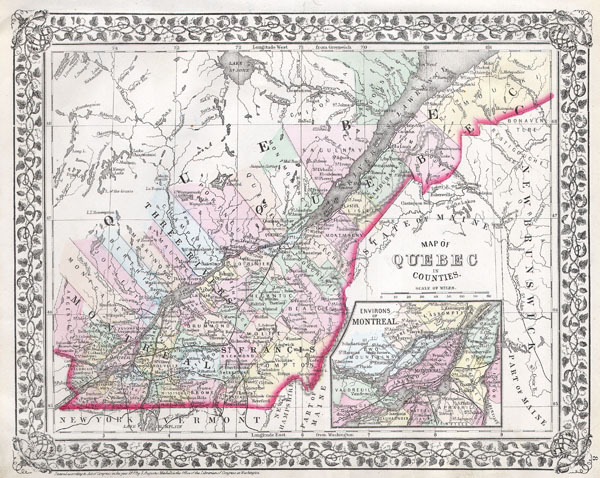 Centered on the St. Lawrence River Valley, this map covers from Montreal to the mouth of the St. Lawrence, north as far as Lake St. John and south to the United States border. An inset map on the lower right quadrant details the environs of Montreal.